The App is severely delayed. Most of the time has an issue connecting to the system. The app is antiquated with no ability to do anything other than turn on/off when you actually can connect. Why even have one. Compared to the Alarm.com app which other security companies use, ADT Pulse does not have 1. 3D Touch to arm/disarm 2. Apple Watch app 3. iOS 12 Siri voice shortcuts. Save yourself time and money and don't get this app... the other reviewers are totally correct when they say this app doesn't work... I could be connected to the same wifi as my system and it either takes forever or won't connect at all... forget the couple extra dollars you spend every month to PAY FOR ACCESS TO THE APP... for an app that works maybe 10% of the time for the security of your home.... COMPLETELY USELESS. App use to be an awesome app and a huge selling point. Ever since the redesign last year, it hasn't been the same and is severely lacking in connection, speed, and crashes which sometimes causes my phone to freeze. Multi million dollar company with a much needed app fix! Please fix! Slowest alarm app I’ve ever used. Connectivity / login unbelievably slow. When it connects, immediately disconnects at times. Very frustrating! You can’t do anything before you connect. Sometimes it takes over a minute to connect! Of course my corporate policy means my phone locks itself in 1 minute, which kills the connection attempt! Unlock the phone try again! An exercise in frustration! I want to get in and out of the app in less than 1 second for it to be useful! PS I have 1 Gigabit internet, so it’s not my problem. I don’t like it that there’s no sound with the cameras, If there were I’d give you a five star! After a year using Pulse it no longer works. I was once able to connect to arm/disarm the system either inside or outside the house, but that no longer works. I continually getan error message thatthe system encountered an error and to try again. Very frustrating. If any developer is out there listening, I want to live in a world where I can simply say “Siri, put my alarms on” and the ADT app would open in the background, scan my face, and lock my home. I also have Arlo security cameras, so adding that to the Siri routine would be amazing too. Please consider this function ADT!!! You have no idea how much more efficient it would be. James was awesome!!! He took the time to show me how to work the app and the new lock. He also worked with our schedule and showed up right on time. The has a huge amount of difficulty connecting to the security system. I will open up the application and wait 10 + mins before it will allow me to interact with the security system. Easy to use & very reliable! The app should have a key pad or ability to arm to stay no delay. The lag on this app for a home security app is extremely disappointing. The ability to remotely arm my system was a big selling point but this app is so poor it doesn’t help. In addition I like to see my system history and it is always behind or incorrect. Shame on you ADT- for how expensive you are in comparison to other home security systems, you should have an app that operates better than this! Great app. I hope future updates will have Siri integration to arm/disarm the Alarm. Clips need to be longer. This is by far the easiest app I have worked with. 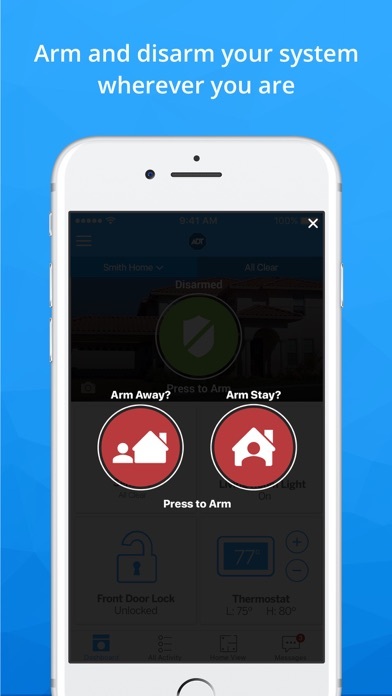 This app makes it super easy for me to arm and disarm my house just with the push of a button. I am only 24 but I plan on sticking with ADT because of the way I feel secure that I can just look at my app and see the last time my door was open and closed and when something happens a police officer will come and ADT will check on me until the problem is resolved. Horrible app and service from ADT. Every time I try logging in, the app it takes a good five minutes to “connect to the server.” Once it’s finally connected and I try to arm, it says “unable to complete due to...” I had cox back in San Diego and their service and app was by far superior. I’m cancelling adt as soon as my contract is up. No touch ID support anymore. It’s a slow app yes, but they completed killed it by removing touch ID login. One star. Can’t wait until my contract is over. Seriously. Barely connects anymore as of 9/23/18. Can't even disarm an active alarm in time because it takes too long to connect on the app. ADT calls you before you can disarm it. Enjoy the ease and user friendliness of this app. Very slow response to the system for arming and disarming. However my biggest concern is why does the home screen not show a live feed? You have to select the area, expand, then wait up to 10 seconds for a live feed. Those extra steps make the system less than ideal taking up to 20 seconds to check your home. Launched with potential but hasn’t really developed. The app is good but my only complaint is the amount time it takes to connect. Sometimes it connects quickly and sometimes it can take a long time. I think the app should have the ability to at least send the disarm or arm command while it is in the process of connecting. Thomas Corcoran installed my home system! Absolutely the best! I called the adt support and they mentioned that I needed to uninstall the app and reinstall to fix our mobile connection issues to pulse. It work....once....for two different phones. Then then the delay occurred again on both phones. As I am paying a premium for this service to work on my phones it should work a majority of the time. I do not think it’s appropriate to uninstall and reinstall the app every time for the app to work. Worthless if you cannot get it to work for the users!! Everything is work very well. The Technician did a great job troubleshooting and resetting the camera. I am very satisfied. The app has gone down a few times already. App hasn’t worked for weeks. Get it together ADT. This app. is absolutely the best...very user friendly. The app needs to be able to Let me adjust the alarm schedule. It’s so annoying that I have to go to the website if I’m going to go on vacation and want to change my schedule. The pulse system is awesome. I love being able to unarm the system without giving codes to visiting relatives. Since I leave for work before my kids leave for school, I am also able to see when they exit the house and if they remembered to put on the alarm. The only thing that I don’t like is that if the power goes out briefly, it will take the system off line and sometimes I am not aware that my power has gone out. Nice app but since I’ve had it I not able to play back the videos that’s being recorded when I want to look at them. Waiting and waiting in the driveway for the app to connect. Really disappointing. I really love the app. the only issue I have is sometimes it freezes and I can’t use it for a while. Other than that it is great! Everyone should have ADT for their home. There is always a connection issue at first. Minute later the app works. Camera is not always working. The app takes a while to load when opened. Also, I wish I was able to set the alarm to stay from the app but other than that it’s a good app. Takes forever to connect and most the time it freezes. Crap!!! I really like that I can arm and disarm outside my home but I’ve had times it freezes or this option is not available. 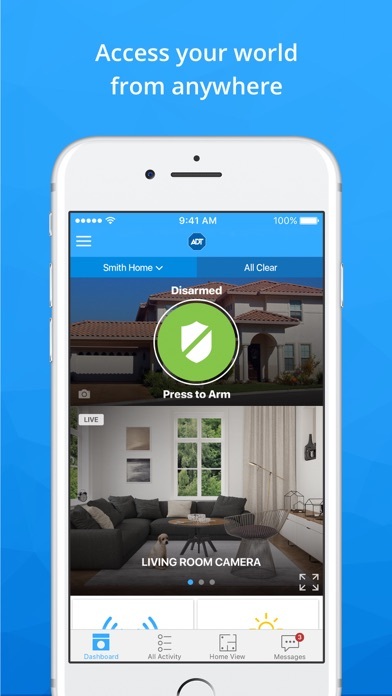 This app makes alarming and disarming your home so convenient. You better never forget to set your alarm at home. I've had this system for 2+ months now. Have never once been able to set my alarm via my phone unless I was physically in my actual house. ADT as a company is fine. The people that come out to your house are courteous and professional, app leaves much to be desired. They always want to blame my internet. But I get the same system error with anything I do on the app. Can't even leave feedback through the app because that doesn't ever connect either. James from ADT came this morning at 8:01 am right on time/ took him about 1.3 hrs to install an put on our phone and IPads.looks nice ,well done ,complete,seem to work well with our system,price was right.now we feel better about our alarm system. Thanks ADT,and James! I hated this update that came over my phone when I was leaving for work , it wouldn’t let me by pass it to set my alarm for my house until I updated- in which I had to leave because I didn’t have time to set it... you should be ableMrs.CClause to update when it’s convenient not mandatory to use ! It upset me because I’m paying for a service I could use because of a update. Love the improvements to the app. UPDATE 2: The tech came and told me the other tech should never have plugged the cloud link into a surge protector so he moved it, tested a few things and left. That was Tuesday, it’s now Friday and the Cloud link has stayed on the whole time and it connects a little faster to the app. Now they just need to train their people to ask this on the phone and make sure the techs know when they install. BTW, still no reply to the email I sent as requested in their response to the original review. UPDATE: I emailed as suggested and never got an answer. I have called ADT on 3 occasions. Time one took forever to resolve, time 2 was same issue, much faster to resolve and person was nice, time 3 was Saturday night and I felt like I was getting the bums rush by someone who wanted to get back to whatever he was doing before I called. He told me to delete and reload the app and call back (where I would obviously get someone else) I’m pretty sure he knew it would not work. I haven’t called back yet and have been getting offline notices all day and the re-downloaded app doesn’t connect. I can’t hear the notices when my phone is in my desk or purse and I’d like to change to a louder tone but if my phone is going to go off every few hours to tell me Cloudlink is offline that can’t happen. Sometimes it’s every 39 minutes. I called ADT and was told it means nothing, the system still works so why send the notice? I’m going to get immune to any tone I set the app to and miss when a real problem occurs and I should be heading home to meet the police. Actually, it already happened when I was out shopping this week but it was a false alarm when my husband entered without disarming the system. ADT offered no way to turn off this particular notice. This app worked fine then a year ago ADT updated it now it connects 1 out of 40 times, and when it does connect it can take up to 20 minutes. I’ve had an ADT tech guy come here and even he could only connect 1 out of 10 times using his equipment. I guess we are paying for the app to give us local temperature. That’s so worth it. Not !!! The app takes an incredible amount of time to connect to the device in home. Easy to use if/when you are finally connected though. I can’t do anything with this app. I’m canceling service after Christmas. Is it possible to configure in the software a timer? I could build the interface and the program to incorporate in the current database. The app is excellent and easy to navigate. My app continues to show 1 issues and it states no cellular connection YET I have check with ADZt monitors and it checks ok. No reason why it would continue to show this. Any help? Love the clarity of the pulse cameras & the scheduling to record clips based on when I am not home or late at night. It would be very much better, when controlling lights, if they could program so our time settings would adjust for sunrise/ sunset. The App forced me to update even though I didn’t have time to do it. It would not let me choose another time. It was early in the morning and I needed disarm my system but no I had to update before I could disarm. TOTALLY UNACCEPTABLE. Just tried to open my app to check an outside camera, when I heard a loud noise. The app FORCED me to update instead. I use FaceID so that I can login/open quickly in just these type of situations. I update all of my apps regularly (weekly), so what is SO important that you would put your customer’s immediate safety at risk for an update?? Terrible! Great; app, access to video, events, and control of the alarm functions all at one location. Providing audio would be a good addition. The $60 Pulse monthly charge is to much. I cannot access the system with this app from anywhere except inside my home. I arm the system when leaving the house, and the app always says disarmed. Useless in its current form, I cannot view the cameras, I cannot arm or disarm except when I am in the house. This is a crappy app. They charge an extra 18$ for the adt pulse service but ha e developed an app that takes forever to bring up the screen to arm and disarm . I have had the app for 18 months and I am going to cancel the service. There are many times I have had to drive home to arm the system physically or had the alarm go on and I wasn’t able to use the phone to disarm it. I find that I periodically leave home & can not remember if I turned on the security system. This app can show whether I forgot (which is great). If I did forget then I can use this app to turn on the security system remotely (which is Really GREAT). This app never seems to work. Always shows ‘offline’ and the reset procedure never works. Really disliking ADT. Can’t wait for my expensive contract to end..then NO MORE ADT. The app for the ADT monitor is great. Because of the app, I can Monitor my home when I’m not there and get a visual picture of the activity of my home when I’m away. Thank you ADT. I’ve never been more impressed by a team of people than the guys who installed my system. No question was too trivial for them to answer. you can turn your alarm on and off and turn your lights in and off it’s the best security system company on the world. I love ADT, keep up the great work!!!! Just got my alarm installed 3 days ago and I haven’t been able to arm or disarm from the app once. I’ve deleted and reinstalled, I’ve reset the test mode on the alarm itself - doesn’t work whether I’m inside or outside the house. Waste of money, controlling it from my phone was the only reason why I chose ADT so I don’t have to carry around the keychain or run in and outside of the house on the timer. To boot, the install technician wasn’t very helpful and when the job was completed he gave himself top ratings from my phone with me seeing it ordering my ADT signs! Ridiculous, sorry I ever chose ADT. We hope that we will always be able to afford this as time as the years go by. Thank all the people at ADT for such a wonderful system. Mr and Mrs David Mackey Sr.
UPDATE: I emailed as suggested and never got an answer. I have called ADT on 3 occasions. Time one took forever to resolve, time 2 was same issue, much faster to resolve and person was nice, time 3 was Saturday night and I felt like I was getting the bums rush by someone who wanted to get back to whatever he was doing before I called. He told me to delete and reload the app and call back (where I would obviously get someone else) I’m pretty sure he knew it would not work. I haven’t called back yet and have been getting offline notices all day and the re-downloaded app doesn’t connect. I can’t hear the notices when my phone is in my desk or purse and I’d like to change to a louder tone but if my phone is going to go off every few hours to tell me Cloudlink is offline that can’t happen. Sometimes it’s every 39 minutes. I called ADT and was told it means nothing, the system still works so why send the notice? I’m going to get immune to any tone I set the app to and miss when a real problem occurs and I should be heading home to meet the police. Actually, it already happened when I was out shopping this week but it was a false alarm when my husband entered without disarming the system. ADT offered no way to turn off this particular notice. Makes life easy and I feel safe and secure. In reality, we do not like the fact that it takes 3.5 minutes for the system to reset after every movement. The fact that you are a security company and pertinent footage has repeatedly been missing at crucial times when it was needed is unacceptable. This fact of 3.5 minutes was misrepresented as 30 seconds to reset which at maximum would have been more acceptable. We have 3 cameras set outside and still don't catch everything. We are frustrated with the customer service as well, so we will not be renewing our contract when it is done! It’s very convenient but connecting takes long time. I’ve tried everything from changing my password, restarting the app, deleting the app. I’ve changed the password and it works for the online website but I can’t log in on the app. The Pulse app does what it’s supposed to do. No complaints. 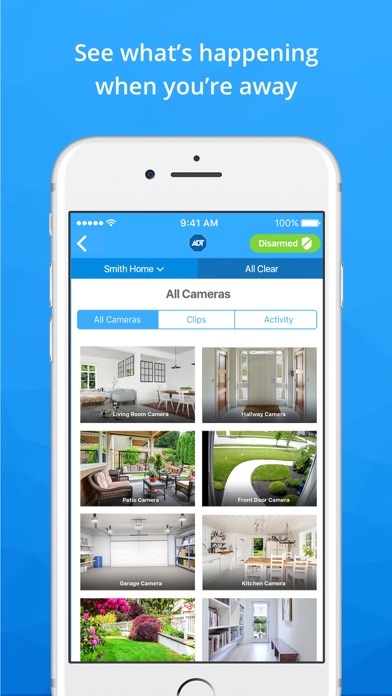 A intuitive well designed app that makes navigating your home security system effortless. Quick access to your cameras as well as your home lighting. You have the ability to set the alarm in two modes, home or away. You also have the choice of setting the alarm system while a window or door is open, great to have on warm summer nights. Overall this app is lite, fast, and has all of the options you would look for while also being easy to use. 5 earned stars. I Love this app because it gives me the ability to set or disarm my Alarm from wherever I am. I loved the app at first but now it doesn’t connect unless I’m in the house on our WiFi which makes it useless. It works for my husband, we have the same phone purchased at the same time. From reading reviews it looks like an ongoing issue. Please fix this! A recent ADT owner. I would like see better notifications from this app. Unless singed in using the app it’s pretty useless. I want to be notified every time a door or window in the house is opened. Connection issues last week. Now, it can Arm, but app doesn’t update to armed status, so I can’t disarm from the app! Same with Alexa. The whole system has gone downhill this month. It’s very convenient especially when I have my hands full. Just got an email saying my rates are going up because they fixed pulse ???? Insane!!! Loads slowly, but overall, it’s a decent app. ADT has respectful and helpful technicians.Satisfied Customer. Excellent system and excellent App - 5 Stars ! You can beat this App. It’s so easy to use and is very helpful ! I turned off a guest house alarm with the app and the panel disarmed but the app is stuck on a burglar alarm alert and wont let me control any functions and will not clear the operation. I called tech support and they had me reset the panel, the app, the base station and reconfigured my login multiple times. Not only was all of it innefective, but the app no longer controlled my main home properly.. So tech support made it worse. And I now need to take time off to have a technician come to the house to fix it. In the interim I have no way to remotely control it to let our construction workers in. Which is a reason I bought the system. Sometimes all of the lights controlled by the app just come on with no prompting, but I still like it. The ADT app allows easy access around the clock to control, maintain and monitor your home. It provides convenience for the homeowners when home or away that what you care about most is secured! I got my cameras installed easily and quickly! Oscar is a great Technician. He was very helpful and informative. Thank you! The app allows us to turn the alarm off from the truck so we don’t have to worry about rushing in when our hands are full. It’s definitely a great thing to have and makes turning on and off the alarm simple. Love the app, but disappointed in live camera feed not working for almost a week. May cancel contract and have the system removed if not resolved soon. When it works, it’s pretty great. Hence 2 stars and not 1. I like being able to arm/disarm from my driveway when I get home. Some days it takes many, many attempts to get it to connect. It is terrible about handling network changes (mobile to WiFi and back again). I have to turn my WiFi off when I get home because I do get a signal in front of my garage. Not strong enough to do anything, but enough to have my phone switch. And Pulse can’t handle that switch. What I really loved (past tense is correct) was the live video feeds. I’m not sure what update broke that. But basically it says “connecting. Connected. Buffering. Unsupported.” and then rinse and repeat. I never get live video anymore. I keep hoping an update will fix it. Support told me to unplug the cameras (ie reboot then). Kind of hard as I’ve got my cameras hardwired in. There isn’t an accessible plug. I guess I could flip a breaker 😝 Luckily clips still work. So I can at least see when something occurred. So the two major features I went with ADT Pulse for - mobile app for arm/disarm and live video don’t work consistently. In the new year, I’ll dig out the paperwork and see how long my contract is. Might be cheaper to break it than to keep living with this nonsense. The app was ok. Sometimes a little slow opening or updating when a device changed state. Now that they removed the option for the garage door tile to be on the dashboard they have made it worse. Why would you do that?? We use the Pulse app more than we use our keypads it seems! I love being able to look into the activities of our home. I recently bought the ADT DOORBELL after having the Ring doorbell for years. I like the doorbell it’s similar to Ring but the major issue is you cannot hear the doorbell throughout the home unlike Ring offering Chime Pro so you can hear the doorbell around the home ADT do not have anything like this. It would be nice to offer something like this and make a chime for your phones, watches & tablets like Ring does. Please make a new feature like this on the app and a doorbell extender. This app has great potential and I love it when it actually works. My biggest frustration is that the app takes about 45seconds to 2 minutes to connect. It doesn’t seem like a lot of time but when you have groceries and a toddler and are trying to disarm the app from the outside, it is an eternity. Sometimes it doesn’t even connect after several minutes. I have contacted ADT but they say there is nothing they can do. I have switched phones and still with the same problem. It has to be an issue with iPhones because my husband has android and the app works flawlessly. Takes about 5-10 seconds to connect. Please improve this app on iPhones because I pay extra every month to have this service that is extremely unreliable. I would like my finger print sign in to work again. I would like my finger print sign in to work again. Can you help me with that at all? It used to let me sign in that way but all the sudden it just stopped. I can’t seem to get an ADT person back to my house since I signed up over 3 yrs ago. Multiple things don’t work on my app and technology is falling behind. I tried to open the app to clear an alarm that had been set off and I’m being asked if I love the app. Horrible timing. Their response time and speed via cellular are best in industry. We had this security system installed not long ago, and already feel secured in our home. I’m a cyclist gone for long period of time. I do for get to set the alarm at times but I don’t have to worry. I can set my alarm with my cell phone, and so easy to use. I highly recommended having your home safeguard.. Wish I could give this app ZERO STARS! Never have any issues with ADT Pulse and it is very efficient when not at home to be able to check on things. Love ADT and the Pulse! Have had it 21 years or more& cant say enough about it! Please add an Apple Watch app. Also, a widget for iOS would be nice. I have a camera over my back yard. It did not go out during Hurricane Irma and all was great. Loved it. I recently went on a trip and the camera went out. I called ADT and since no one was there she said she could be of no help to me. When I got back it was the internet went out. So what good is it then? I went about 2 weeks with no Pulse coverage of the yard and 4 or 5 notes saying there was a problem with all the other alarm points. She suggested it might be the internet and said the alarms were showing still active but I didn’t trust that. It never occurred to me to call the internet folks. Can they reset you internet over the phone? Will they?. I changed my plans and came back a few days earlier. That has been my only negative experience in over two years. So I love Pulse and being able to turn on and off using my phone. Not sure what good it does when I am away and can’t reset the internet. Easy to use providing a peace of mind. Glad to have it available. Great to check pulse from phone! Love the app! Sometimes it seems like it take a while to connect or sends a message that it is having trouble connect which can make it frustrating when trying to connect quickly. App is decent for what u I need it for. Good to alarm and dis arm remotely, check on zones etc. lazy in bed, set alarm at night, great. Don’t like the fact that pulse was an extra $15 a month or so. I have ring so I don’t need cameras through ADT. Sill, the app is pretty good. Would be good if I can tie to run cameras. Maybe you can? Makes it easy for when I don’t arm inside house. Only issue is I’ve noticed it takes longer to connect in order to press the arm button. Need better cameras, like the ones with ring. Having the ability to use my phone to have access to our home security is very comforting. I can set the alarm & turn the alarm off with 1 click. Being able to look to see if any doors/windows have been messed with is another feature that I love. Works most of the time. Would be five stars if it were flawless but that’s a tough standard. I wish I could add more camera to the system but our rep said 10 cameras was maximum for pulse. Love ADT. The monthly payment is perfect. I get alerts when my kids are home I can turn the alarm off from my phone when my friends or family come over to feed my animals without having to give my pw to my alarm out. Siento mi casa más segura. También puedo verla. Aunque no evita los robos los diminuye y deja una grabación de lo sucedido. Using the App, allows you to turn your alarm on/off from anywhere. You can also turn lights on/off. Can’t wait to use this garage door feature. App is great and easy to use, I just wish there was the ability to select and delete multiple clips at once from my cameras. With an alert set up to record a clip when motion is detected and many clips through out the day from the one on my garage picking up passing cars I need the ability to delete multiple videos at once instead of just one at a time. Please release this in the next update. I have the pulse app so I can turn my alarm off and on remotely from my phone but when I go into the app it always says “connecting” and no matter how long I wait it never connects so I can use this function. I can open and close my garage without delay but my alarm system 60% of the time doesn’t work. Not sure if my system is faulty or problem with app function. Latest update is great and to manage devices from the app is a plus. Can you please add to Siri shortcuts? Also please fix the skill for Alexa to make it "Smart Skill". Like other smart skills and not "tell ADT" none sense and make it work all the time not sometimes. 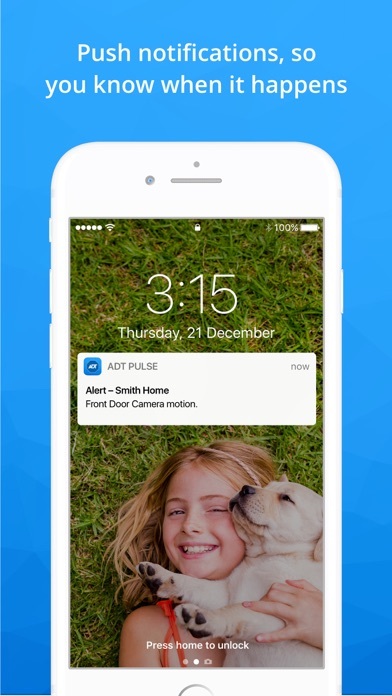 ADT app these amazing. You will not regret it on the iPhone. 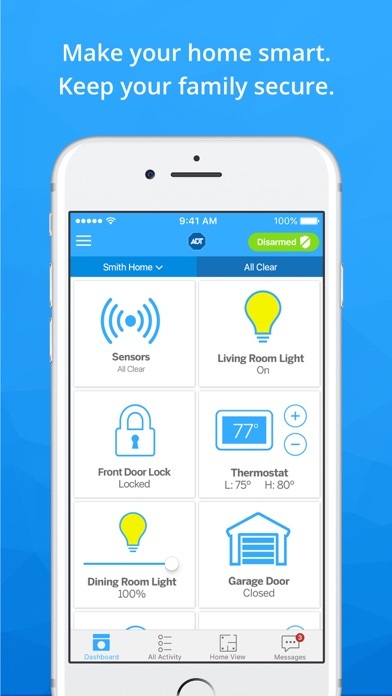 In fact, because of the ADT app my home is more Automated. The flexibility of having a way to control the alarm from a distance is completely invaluable. We have had the camera’s for about three months now. We travel a lot and it is good to be able to see that everything is good at home. ADP has come through the one time we did need an officer at our home. The problem was resolved quickly. The assurance for travelers can’t be overstated. This app loses ability to manage alarms regularly. When app fails, the only resolution is to return home to physically unplug system to reboot. ADT can’t do anything remotely, so basically this app is often worthless. We still have to wait for ADT to call you to know if someone is breaking in. We upgraded to Pulse so we would have real time access/alerts to this system. We now pay more monthly for the same quality of service we had before. Unreliable and extremely disappointing. App is fast and responsive but has no support for Widgets, interactive iOS notifications, geofences, shortcuts, IFTTT, or Siri commands. Since your last update, my husband and I can no longer use our fingerprint password on our iPhones. My iPad still works. Please fix! Video upgrade to the Pulse system is awesome. Rafal Sikorsky the installer was so very professional and helpful. He spent time to make sure I knew all of the features and really helped optimize our system. With my busy work schedule and being away every so often, I still feel like I’m in the home with my mom. It’s a comforting feeling to check up on her anytime and being able to see her. THANK YOU! Cannot arm or disarm from this app please fix!!!!!!!!!! ASAP!!!!!!!!!! Even after new update on May 11, 2018 still doesn’t work!!!!! Still not working!!! - update 8.4.2 on 09-27-2018 Connectivity is not an issue tried 4 different devices using other people’s WIFI, my home WiFi, 4G and LTE tried it all NOTHING!!! Also tried deleting app and reinstalling NOTHING!!! Also tried logging out and logging back in NOTHING!!! Security at your fingertips!! Amazing! Fast and easy installation. Great Installer! Feel much safer now! Thank You ADT !! !